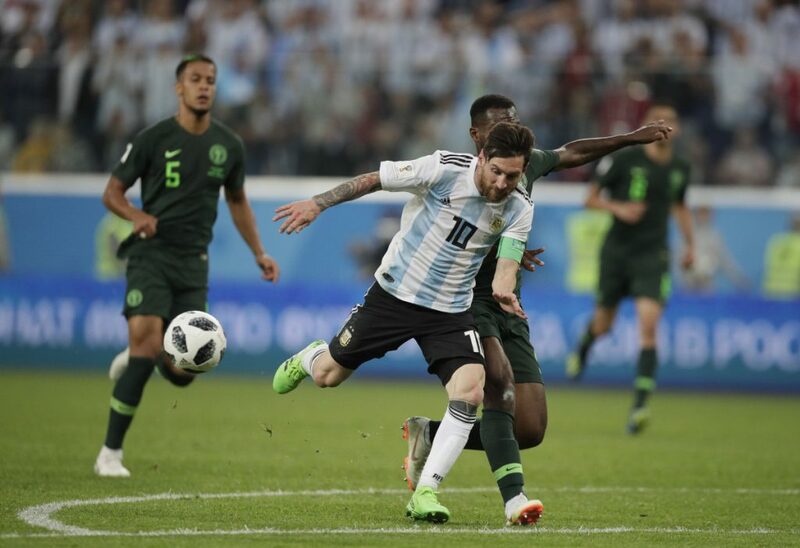 Lionel Messi scores in the 14th minute and Argentina scores again late to beat Nigeria to advance to the Round of 16. Messi and Banega controlled the game in the first half. Rojo finished it off in the second by cushioning a volley with his right foot into the bottom corner and ensuring Messi’s quest for a first World Cup title continued. Argentina will play France in the Round of 16 in Kazan on Saturday. If Argentina wins and Portugal beats Uruguay on Saturday, Messi would face Cristiano Ronaldo in the quarterfinals. Instead, it was Messi who was at the center of the celebrations. His teammates formed a circle around him while striker Gonzalo Higuain cried nearby. Before Rojo’s goal, Nigeria had been only a few minutes from qualifying for the Round of 16 for the fourth time. Nigeria complained about not being awarded a second penalty. There were about 15 minutes remaining, and Nigeria was enjoying a strong spell of pressure when the latest video review talking point of the tournament came. Rojo was the only Argentina defender in the penalty box, and under pressure from striker Odion Ighalo lurking behind him, when he jumped high to head Ahmed Musa’s deflected cross away from danger. Instead, Rojo completely mistimed the header and the ball ended up glancing off his left arm, and then falling invitingly to Ighalo near the penalty spot. Ighalo had lots of time to pick his spot, but blazed the ball wide of the left post. Nigeria’s players were sure it was a penalty, however, and Turkish referee Cuneyt Cakir – who awarded Nigeria a penalty early in the second half – used video to review this one and stood by his initial decision not to award a spot kick, much to the frustration of Nigeria’s players.